Come join Cycling Adventures in Albuquerque New Mexico for an Epic Cycling Camp & The 44th Hot Air Balloon Fiesta!! Cycling Adventures host small, personalized bike tours in a Fun & Adventurous setting!! Whether you're into history, culture, outdoor adventures or just in need of some new and unique scenery, Albuquerque offers exciting attractions for all ages and interests, anytime of the year. In the historic section of Old Town, ancient Indian and Spanish cultures come to life through old churches, quaint shops and piazzas, winding brick paths and adobe benches. After working up an appetite, head to any number of fine restaurants that serve up a choice of hot or even hotter New Mexican cuisine. To top it all off, take a ride on the Sandia Peak Aerial Tramway http://sandiapeak.com for spectacular views of all this vibrant city has to offer. Albuquerque, New Mexico offers many amazing bike routes ~ The Ride to Placitas, The Gilman Tunnel Ride, Santa Fe Train Ride, The Climb to Sandia's Crest and cycling on the nostalgic Old Route 66!! 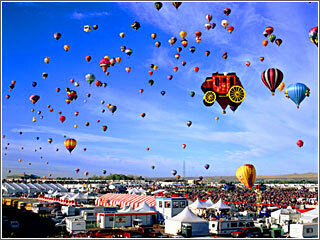 In addition, Albuquerque hosts the largest tourism event in New Mexico and the biggest ballooning event in the World!! Week 1- Oct. 1st-6th is geared for more advanced riding and less balloon fiesta! Week 2 - Oct. 7th-12th is geared for less riding and more balloon fiesta! Cycling Adventures will arrange accommodations, food, activities and support!! As for the bike ~ riding your own bike is a big benefit on a multi day tour!! 2 tickets (sessions) for the Balloon Park to view hundreds of colorful hot air balloons & participate in fiesta activities!! RSVP now ~ Space is Limited for this EPIC Adventure!! Come join us in Albuquerque New Mexico for the Annual Balloon Fiesta & Cycling Camp!! Many amazing routes can be found in New Mexico ~ Santa Fe to Taos, Ride to the Crest & sections of Old Route 66!! Evenings & Mornings we will have an opportunity to view the launching of hundreds of colorful air balloons and participate in Balloon Fiesta Festivities!! Cyclists manage their own transportation to New Mexico ~ but Cycling Adventures will arrange accommodations, food, activities and support!! RSVP now to be included in the next EPIC Adventure! !